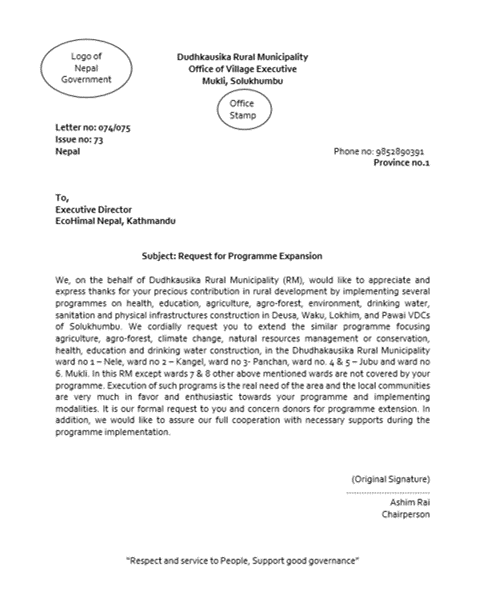 Our NGO partners in Nepal, EcoHimal, have received a letter from Mr. Ashim Rai, Chairperson of Dudhkausika Rural Municipality. The Dudhkausika rural municipality is home to around 20,000 people who live across nine VDCs (Village Development Committees). The Glacier Trust (TGT) has thus far focused on two neighbouring VDCs, Deusa and Waku. Deusa is home to the Agro Forestry Resource Centre that TGT played a big role in establishing. Deusa AFRC has become a hub for Climate Change adaptation; its services are being used by farmers from Deusa, Waku and an increasing number from other VDCs in Dudhkausika. The impact has not got unnoticed. In his letter (see translated version below), Mr Ashim Rai expresses how much the local authority appreciates the work EcoHimal and TGT have been doing over the last five years. This sort of recognition is fantastic and a real boost for everyone involved in the work. As the letter goes on to say, Mr Ashim Rai, would like TGT and EcoHimal to extend their work to other parts of Dudhkausika. We have started to do this, training events (such as the recent coffee training workshop) are open to farmers from across the muncipality and many come from outside of Deusa and Waku to attend these. We have also funded the establishment of plant nurseries that act as 'satellites' of the AFRC. These nurseries, run by AFRC trained farmers, make it easier for farmers to get the plant seedlings they need and advice on how to nurture them. The AFRC model is working, as a small charity, our aim is always to pilot and test innovations that enable climate change adaptation in a sustainable way. Deusa AFRC will soon be financially self sufficient, allowing TGT to direct funding to other locations. We believe that the AFRC model can be replicated and encourage other, larger NGOs, to learn from what we are doing and fund similar projects across Nepal.